Revelation 2:18 "To the angel of the church in Thyatira write: These are the words of the Son of God, whose eyes are like blazing fire and whose feet are like burnished bronze. The church in Thyatira is perhaps the smallest of the seven churches yet it received the longest and most difficult letter. Thyatira was on the site where modern day Akhisar in Southern Turkey is located and is about 42 miles inland from the Aegean Sea, and 47 miles south west of Pergamum. This letter can be considered the centerpiece of the seven letters written by Jesus. The city itself was insignificant but Jesus' words and actions in the church there had something of central importance to teach all his churches. Although an important city in its own right, at times it protected Sardis, 37 miles to the south, from Pergamum to the northwest - and at other times it was controlled by the rulers of Pergamum to protect the southeastern approach to their city. Near the center of Akhisar, visible archaeological remains are located in a fenced off rectangular city block. From coins it is evident that guilds of bakers, bronze smiths, wool workers, potters, linen weavers and tanners were active in the city. Such guilds would often hold banquets that included the eating of food offered to idols and participation in immoral sexual acts. Lydia, converted by Paul in Philippi, was a dealer in purple cloth from Thyatira (Acts 16:11–15). Evidently the purple used to dye the cloth was from the local "madder" plant, and not from the murex shellfish from Phoenicia. 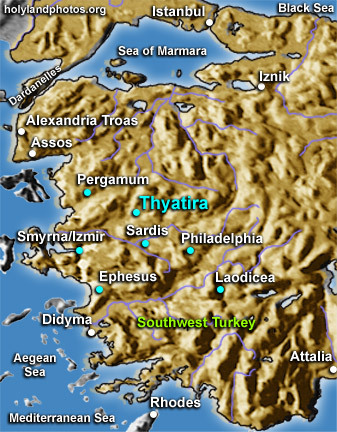 Thyatira had been a military outpost on the western border of the kingdom of Seleucus, who ruled from Antioch in Syria. Located in the middle of a broad valley, Thyatira was an easy target for capture, so it had changed hands repeatedly in the ebb and flow of eastern Mediterranean politics between Alexander's death and the rise of Rome. Lacking religious and political significance, Thyatira's identity was molded by commerce and manufacturing industries, each dominated by a trade guild dedicated to a patron God or goddess. Among the trades most in evidence in the archeological remains are metalworking and the dying of fabrics, a trade in which Lydia was engaged. The influence of the economic sphere of life, exemplified in the trade guilds, challenges the church's fidelity. The church was under pressure to conform to the standards dictated by commerce and the successful businesses that practiced their networking, marketing, and secular practices in and among the believers. Although Jesus later commended them for remaining faithful in their love, he rebuked them severely for being more tolerant of heinous practices. Psalm 2:7 - 9 I will proclaim the decree of the LORD: He said to me, "You are my Son; today I have become your Father. 8Ask of me, and I will make the nations your inheritance, the ends of the earth your possession. 9You will rule them with an iron scepter; you will dash them to pieces like pottery." Revelation 2:19 I know your deeds, your love and faith, your service and perseverance, and that you are now doing more than you did at first. The church at Thyatira is strong in love and faith, in service and perseverance. It is strong not only where other churches are strong, but also where the Ephesian church is weak: in love demonstrated in service. Whereas Ephesus needed to return to its ‘first deeds,’ Thyatira had so grown in faith and love that its recent deeds had excelled those done at first. This church was growing in its spiritual life and Jesus commended them for that. The flaw, however, in the Thyateran’s growing faith and love was naïveté, a lack of discernment that took people at face value rather than putting them to the test of truth. We spoke earlier in this study about a zero tolerance approach that one should have towards the teachings of the church and other brothers and sisters. Although it sounds extreme at the outset to teach zero tolerance towards other members of the body of Christ, especially if one includes the teaching and work of pastors and ministers also, zero tolerance has preservation at its core. The Bereans were commended for their diligence in searching the Scriptures to see if what Paul was saying was true. (Acts 17:11). Similarly, we may deduce, it would be appropriate to examine what anyone is saying concerning the gospel and the church in general. If one were to find something incompatible with Scripture, on a zero tolerance basis, it would serve a dual purpose to speak out immediately. The first purpose would be to learn the truth if one were wrong about the incompatibility. The second is to teach others the truth. To have any measure of tolerance is to allow either ignorance or purposeful deceit to take hold in the church. Zero tolerance doesn’t mean no compassion, but it rather means the immediate institution of the precepts of Matthew 18:15 cf, so that there is always ample room for teaching, learning, and repentance. And excommunication if a hardened heart is among us. This word at the beginning of the rebuke, indicates the contrast that Jesus strikes between their faithfulness on the one side, and their flaws on the other, as if there can be no merit earned from those things that are done well, to offset those things that are at variance with the gospel. One cannot earn commendations that will provide greater tolerance for mischief. So, with this word Jesus clearly separates that which is good from that which needs to be repented from. Jesus says to the church at Thyatira, “I love your love, but I hate your tolerance.” The target of their tolerance and Jesus’ disapproval is a woman whom Jesus calls Jezebel. This is not her real name but she is working the same mischief than the princess of Sidon and wife of Ahab had worked in Israel centuries earlier. The ancient Jezebel wielded her influence to seduce Israelites into Baalism. Let’s read about her ancient namesake. I Kings 16:30 – 34 Ahab son of Omri did more evil in the eyes of the LORD than any of those before him. 31He not only considered it trivial to commit the sins of Jeroboam son of Nebat, but he also married Jezebel daughter of Ethbaal king of the Sidonians, and began to serve Baal and worship him. 32He set up an altar for Baal in the temple of Baal that he built in Samaria. 33Ahab also made an Asherah pole and did more to provoke the LORD, the God of Israel, to anger than did all the kings of Israel before him. 34In Ahab's time, Hiel of Bethel rebuilt Jericho. He laid its foundations at the cost of his firstborn son Abiram, and he set up its gates at the cost of his youngest son Segub, in accordance with the word of the LORD spoken by Joshua son of Nun. It is now clear why Jesus called this Thyatiran prophetess ‘Jezebel’ because she mimicked her namesake predecessor in respect to the wickedness committed against God. She is seducing Jesus’ servants to commit acts of immorality and eat things sacrificed to idols. Despising the gospel of Christ because it is so simple and so public, leaving no secrets hidden from the uninitiated, the prophetess promised insight into ‘deep things,’ which Jesus labels Satan’s deep things. An interesting indictment lies in Jesus’ words “who calls herself a prophetess.” It is not as if she was proven to be a prophetess, but she was an obvious fraud, but yet the believers allowed her to influence the way in which they practiced their faith. Even the omission of action against her caused Jesus to lash out against this sin of tolerance. It is also rife in our times today that believers would tolerate practices and people who engage in frivolous arguments and genealogies, calling it deep things, complicating the true, simple message of the gospel. Job 15:3 Would he argue with useless words, with speeches that have no value? I Corinthians 8:1 Now about food sacrificed to idols: We know that we all possess knowledge. Knowledge puffs up, but love builds up. I Timothy 4:7 Have nothing to do with godless myths and old wives' tales; rather, train yourself to be godly. Titus 1:13 – 16 This testimony is true. Therefore, rebuke them sharply, so that they will be sound in the faith 14and will pay no attention to Jewish myths or to the commands of those who reject the truth. 15To the pure, all things are pure, but to those who are corrupted and do not believe, nothing is pure. In fact, both their minds and consciences are corrupted. 16They claim to know God, but by their actions they deny him. They are detestable, disobedient and unfit for doing anything good. The combination of sexual immorality and food sacrificed to idols suggest that many trade-guild banquets (business lunches and business trips in modern lingo?) were held in honor of the guild’s patron deity, especially in a city as dependent on manufacturing as Thyatira was. To opt out of such events in which social and business purposes blended, would mean forfeiting social acceptance and risking economic loss. Perhaps among the deep things disseminated by the prophetess was the insight that the bodily behavior is spiritually insignificant, so that those in the know could participate in idolatrous guild feasts, and even their sensual excesses, with spiritual impunity. Such a Jezebel was more dangerous to Jesus’ servants than a military oppressor, because her secrets drive a wedge between God and his people. Jesus has warned her but she wouldn’t listen and repent. The relationship between God and his people is also described as a holy marriage and that idolatry and unfaithfulness destroy this holy relationship just as adultery destroys a marriage. Jezebel’s wickedness has the same twofold dimension to it, namely, it manifested in the adultery of the people, and it led the participants in her wickedness to stray from God. Revelation 2:22 So I will cast her on a bed of suffering, and I will make those who commit adultery with her suffer intensely, unless they repent of her ways. This expression alludes to the illness that will befall her. It’s interesting to note that the sin of the congregation is here illustrated in terms of the role of the woman, i.e. her children would suffer, the church is idolatrous in its relationship with a harlot, and so on. It would be absurd to view the women of the church as anything other than fellow believers with men, but it is instead indicative of the power of the lure of the devil to let the body of Christ stray from its Head, just as the lust of an immoral relationship between men and women destroys what is good. The prophetess is a local expression of the harlot Babylon, who is to appear in Revelation 17. As the harlot seduced kings, nations, and merchants to commit adultery with her, so Jezebel’s devotees in Thyatira are those who commit adultery with her. As the harlot’s fall would cast her lovers into grief, so Jezebel’s fall will entail tribulation for her suitors. Like the harlot, the Thyatiran prophetess advocated an adultery that was sexual and spiritual. How convenient, in a city dominated by trade guilds, for a prophetess to reveal the deep secret that Christians need not suffer loss by refraining from the guilds’ immoral and idolatrous celebrations! The harlot offers the profits of participating in the ceremony that flows from Rome. Her siren song sounds sweet, but in her chalice is the blood of Jesus’ witnesses. Revelation 17:6 I saw that the woman was drunk with the blood of the saints, the blood of those who bore testimony to Jesus. When I saw her, I was greatly astonished. Materialism, no less than persecution, is the serpent’s weapon of war against Christ’s church. Jesus warned Jezebel and gave her time to repent, but she did not see that God’s patience would not produce complacency but repentance: a mistake the wicked often make. II Peter 3:9 The Lord is not slow in keeping his promise, as some understand slowness. He is patient with you, not wanting anyone to perish, but everyone to come to repentance. Jesus gave the church time to show real love to this Jezebel, her lovers and her children. Although the lovers and children spoken of here, are not her physical offspring, but rather reflects those who allowed greater tolerance for sin and wickedness to infiltrate the church. God would be perfectly just if he treated these ‘lovers’ and ‘children’ as though they were her physical offspring and who, when she has secured her grip on their hearts, become so enmeshed in her corruption that their identity becomes inseparable from hers. The struggle, after all, is between the children of the heavenly woman, the people of God, and the children of the harlot. Revelation 2:23 I will strike her children dead. Then all the churches will know that I am he who searches hearts and minds, and I will repay each of you according to your deeds. The scope of this message stretches way beyond that of Thyatira alone. All the churches, all the congregations, will know that God searches hearts and minds and will destroy evil and wickedness, so that the righteous may live. Psalm 7:9 O righteous God, who searches minds and hearts, bring to an end the violence of the wicked and make the righteous secure. Tolerance of ignorance and deviation from the true Word of God, is to invite the Serpent’s venom into his Body. Revelation 2:24 Now I say to the rest of you in Thyatira, to you who do not hold to her teaching and have not learned Satan's so-called deep secrets (I will not impose any other burden on you). Again, Jesus separates those who strayed from those who persevered: “Now I say to the rest of you…” Their perseverance pays off in the blessed promise of Jesus. They share Jesus’ intolerant love and they will also share his messianic authority as the enthroned Son of God and all that comes with that promise. Addressing those who did not participate in the adultery of the so-called prophetess, and did not believe the so-called deep secrets of Satan, they are the ones who are set apart from the others. Jezebel’s deep secrets seem to teach that to be able to truly overcome sin, one should first become acquainted with the most wicked of sins to learn how to rule of them. But, as we have seen in the introduction to this study, one does not need knowledge of evil to combat evil, but rather knowledge of God is what combats evil. Revelation 2:25 Only hold on to what you have until I come. The word ‘only’ is very significant, in that it reinforces the argument that one doesn’t need all these additional precepts that were taught as the path to knowledge of God, but that they should ‘only’ hold on to what they had, which is the pure gospel. The gospel requires that the truth be sought and verified. There are no secrets hidden in the gospel that have been entrusted to prophets or preachers and that can only be revealed by them. The purpose and design of the gospel are all in the Scriptures and they are not qualified or altered by anything outside of Scripture. The instruction of this passage is to hold fast to the gospel until the Second Coming of Christ; not to be swayed by intellectual arguments that might make sense in the light of custom and tradition, but which are in conflict with Scripture. The words ‘…until I come’ give clear scope to this admonition, namely, there is to be no letting up or tiring of resolve, but keep on holding fast to the gospel until Jesus’ return. The enemies of Christ work in many ways and politics is no exception. Although Thyatira has been a pawn in the struggle of regional politics, Jesus promises to Christians in this town a share in his authority of the nations. Revelation 2:27 'He will rule them with an iron scepter; he will dash them to pieces like pottery'--just as I have received authority from my Father. Jesus quotes here from Psalm 2:9, just as he proclaimed that the Psalms speak of him. Revelation 19:15 Out of his mouth comes a sharp sword with which to strike down the nations. "He will rule them with an iron scepter." He treads the winepress of the fury of the wrath of God Almighty. Once again, Jesus gives all credit to the Father, just as he, as truly God, could have claimed to be the Author of the judgment, but he did not; instead he yielded to the Father. Just as he received this power and authority from the Father, so he also ministers it to those who will overcome. Psalm 89:27 I will also appoint him my firstborn, the most exalted of the kings of the earth. Psalm 110:1 – 3 The LORD says to my Lord: "Sit at my right hand until I make your enemies a footstool for your feet.” 2The LORD will extend your mighty scepter from Zion; you will rule in the midst of your enemies. 3Your troops will be willing on your day of battle. Arrayed in holy majesty, from the womb of the dawn you will receive the dew of your youth. John 13:3 Jesus knew that the Father had put all things under his power, and that he had come from God and was returning to God. Revelation 2:28 I will also give him the morning star. Having Jesus is having eternal life. II Peter 1:19 And we have the word of the prophets made more certain, and you will do well to pay attention to it, as to a light shining in a dark place, until the day dawns and the morning star rises in your hearts. And he promises himself to those who overcome. In a vision Balaam had seen a star emerging from Jacob, a scepter rising out of Israel to crush Moab. Jesus promises his people not merely dominion but a better treasure, deeper joy: himself. Revelation 2:29 He who has an ear, let him hear what the Spirit says to the churches. Revelation 3:1 "To the angel of the church in Sardis write: These are the words of him who holds the seven spirits of God and the seven stars. I know your deeds; you have a reputation of being alive, but you are dead. The church in Sardis receives punishment and only a few people are worthy. Sardis is an ancient city that existed 1,000 years B.C. Later it became the capitol of king Croesus of Lydia, which fell to the Persians under Cyrus. Croesus, (560–c.547 B.C. ), was well known for his great wealth. He was the son of Alyattes. He continued his father's policy of conquering the Ionian cities of Asia Minor, but on the whole he was friendly to the Greeks, and he is supposed to have given refuge to the Athenian statesman Solon. Threatened by Cyrus the Great of Persia, Croesus allied himself with Amasis II of Egypt and Nabonidus of Babylonia against the Persian might, but the alliance was of no avail. Sardis had a golden past and misplaced security. Its gold was repuded to extend back to King Midas of Phrygia, who, as the story went, rid himself of the Golden Touch by washing it off in the springs of Pactolus, a stream near Sardis that had gold dust in its silt. Croesus' reign ended when the Persian troops climbed a cliff leading to the acropolis of Sardis at a point where there were no guards stationed because they never feared an attack from that sheer and impregnable side. The city fell quickly and ancient commentators blamed Sardis's tragic fall on a lack of vigilance in its defenders. Though the story was well known the church in Sardis had not heeded the lesson of Croesus' misjudgment. The seven spirits of God indicates the complete authority of Jesus, being of the whole and entire Spirit of God. Linking the seven stars to the absolute authority of Jesus, he also proclaims that he is the only and complete source of all light, the Head of all believers. "I know your deeds," once again Jesus proclaims that he is the one who searches all minds and hearts and there is no way in which he can be deceived. Jesus has no word of appreciation for this church but only judgment and the judgment rendered is not of a minor nature either, but that they are dead. It is interesting to note the structure of this accusation: the deceit of a 'reputation of being alive' on the one hand and the truth 'but you are dead' on the other. It is almost as if Jesus says that they are in a sleep that leads to death. This church is very much a reflection of some churches and individual today, while proclaiming to be a church of believers, they are not. It is a contradiction between name and reality. In name a church, but measured against Scripture there is nothing. II Timothy 3:1 - 5 But mark this: There will be terrible times in the last days. 2People will be lovers of themselves, lovers of money, boastful, proud, abusive, disobedient to their parents, ungrateful, unholy, 3without love, unforgiving, slanderous, without self-control, brutal, not lovers of the good, 4treacherous, rash, conceited, lovers of pleasure rather than lovers of God-5having a form of godliness but denying its power. Have nothing to do with them. Revelation 3:2 Wake up! Strengthen what remains and is about to die, for I have not found your deeds complete in the sight of my God. Jesus knows that there is a small remnant among them that are worthy, and this urgent call is for the church to immediately realize their sinful state and reach for those few who are faithful. This call is not a warning or a suggestion, but it is an immediate call for action. Jesus calls them to wake up before even that little they have are about to die with their reckless ignorance of their situation. This wakeup call is different than those given to the previous churches, who had endured attacks from the Nicolaitans and other wicked people like the prophetess. There is no specific cause of this sleep unto death. Although Sardis is known to have had a strong Jewish community and a vibrant paganism, the letter mentions no external sources of intimidation, social rejection, or persecution, such as the other churches encountered from Satan's throne. Nevertheless, this church was spiritually unconscious. A clue lies in the accusation 'I have not found your deeds complete in the sight of my God.' Perhaps if they remained true to the Scriptures, they would have found direction. I Samuel 2:3 "Do not keep talking so proudly or let your mouth speak such arrogance, for the LORD is a God who knows, and by him deeds are weighed." Ezra 9:13 "What has happened to us is a result of our evil deeds and our great guilt, and yet, our God, you have punished us less than our sins have deserved and have given us a remnant like this." Psalm 14:1 The fool says in his heart, "There is no God." They are corrupt, their deeds are vile; there is no one who does good. Hosea 5:4 "Their deeds do not permit them to return to their God. A spirit of prostitution is in their heart; they do not acknowledge the LORD." But they were blinded by their own pride and was lulled into a false sense of comfort that even if they had read these passages, they would never have realized that these words from Scripture speak about them: they were truly asleep unto death. Jesus' repeated exhortation to 'wake up' and his threat to break in on the congregations' comatose comfort, 'like a thief' show that Sardis had lost consciousness of Jesus' future return and its present implications. They are exhorted to remember the circumstances they were in when the gospel was brought to them through preaching and they repented and became believers, so that they might recall the true attitude of the believer and be ashamed and repent. If they do not heed the warnings, then the judgment will come to them without warning: there is not time to wait and not time to still enjoy their existing lifestyle a bit longer. They should turn immediately to avoid being destroyed. As far as is known, Sardis was twice occupied as a result of unwariness and complacency. The words of Jesus play on this historical fact and that they are equally in danger of being destroyed due to the same causes that cost Croesus his kingdom. Matthew 24:43, 44 But understand this: If the owner of the house had known at what time of night the thief was coming, he would have kept watch and would not have let his house be broken into. 44So you also must be ready, because the Son of Man will come at an hour when you do not expect him. I Thessalonians 5:2, 3 For you know very well that the day of the Lord will come like a thief in the night. 3While people are saying, "Peace and safety," destruction will come on them suddenly, as labor pains on a pregnant woman, and they will not escape. II Peter 3:9 - 12 The Lord is not slow in keeping his promise, as some understand slowness. He is patient with you, not wanting anyone to perish, but everyone to come to repentance. 10But the day of the Lord will come like a thief. The heavens will disappear with a roar; the elements will be destroyed by fire, and the earth and everything in it will be laid bare. 11Since everything will be destroyed in this way, what kind of people ought you to be? You ought to live holy and godly lives 12as you look forward to the day of God and speed its coming. That day will bring about the destruction of the heavens by fire, and the elements will melt in the heat. Revelation 3:4 Yet you have a few people in Sardis who have not soiled their clothes. They will walk with me, dressed in white, for they are worthy. Even though the church was at the brink of disaster, there are still a few people who 'have not soiled their clothes.' This illustration is given to emphasize their polluted state and that these few true believers have kept their lives unpolluted in spite of the pollution that the church lived in. But, as Jesus promises, they will walk with him, dressed in white (the robe of victory), because they are worthy. Sardis had forgotten that it is engaged in spiritual warfare and Jesus' summons to 'wake up' have military overtones not only in view of their sad history but also in the use of the same term elsewhere in the New Testament. I Peter 5:7 - 9 Cast all your anxiety on him because he cares for you. 8Be self-controlled and alert. Your enemy the devil prowls around like a roaring lion looking for someone to devour. 9Resist him, standing firm in the faith, because you know that your brothers throughout the world are undergoing the same kind of sufferings.